If your parent has been diagnosed with Alzheimer’s disease, while the initial news may seem overwhelming, it is important to know that the disease is manageable, and there are resources that can help your ensure your parents gets the care and support he or she needs. These resources are becoming increasingly important as the prevalence of Alzheimer’s disease continues to grow. Every 67 seconds, one more person in the U.S. is diagnosed with this condition, which accounts for 60 to 80 percent of all cases of dementia. Overall, the number of people living with Alzheimer’s disease in this country is expected to triple from 5 million to as many as 16 million by the year 2050. Early-stage disease patients have memory loss, display small personality changes and may not be able to perform tasks that require planning, such as grocery shopping. Moderate disease patients have more obvious neurocognitive problems compared to what they display during the early stage. They may also experience issues with incontinence, recognizing loved ones and restlessness. Severe disease patients need help with everyday functions and may have trouble walking, sitting up or swallowing food. 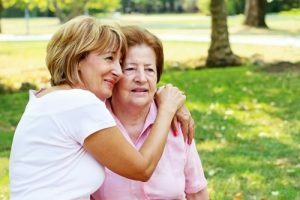 If your parent has been diagnosed with Alzheimer’s and you have decided to take on the role of caregiver, you need to be prepared for several challenges. This form of dementia can lead to sleeping problems, delusions, paranoia, wandering and aggression. Additionally, your parent may have difficulties communicating, such as trouble finding the right words while speaking, losing the train of thought while talking, becoming sensitive to the tone of people’s voices or, if a parent is multilingual, no longer understanding a particular language. Communication problems can be a great source of frustration. As a caregiver, there are several adjustments you can make to help your parent cope with Alzheimer’s disease. While assisting your parent with tasks, improve household safety, plan daytime activities that promote nighttime sleepiness and use gentle touching to reassure him or her during times of paranoia. However, it is also important to remember that you do not have to tackle these problems alone. Home health aides can provide care and company for all or part of the day. Meal services provide cooked food (but do not feed clients). Adult day care services transport clients to a facility where they spend the day with staff who are trained to provide them with activities and safety, thus giving you a break. Respite services provide temporary stays in a care facility for up to a few weeks in case you need to travel. Geriatric care managers make home visits to assess your parent’s needs and suggest resources. Mental health counselors and social workers evaluate your needs to make sure you stay healthy while acting as your parent’s caregiver. Hospices provide end-of-life care and support for you and your family. Turning to these resources will significantly reduce your caregiving-related stress. This helps ensure you stay physically and mentally healthy, which further enables you to look after your parent’s best interests. If you need help discussing your parent’s current needs, as well as planning ahead for the future, talk to a health advisor to assess the situation and create a personalized healthcare strategy for eldercare.